If you’re familiar with transmissions like the Chrysler TorqueFlite and GM Turbo Hydra-Matic (among others), you may have heard of the “Simpson gearset.” In this installment of Ate Up With Motor, we look at the origins and function of the Simpson gearset and briefly introduce you to its inventor, the late Howard W. Simpson. Born in 1892 in Kalamazoo, Michigan, Howard W. Simpson studied engineering at the University of Michigan and after World War I went to work for Henry Ford’s farm tractor company, the Henry Ford & Son (Fordson) Tractor Plant. Fordson became a division of the Ford Motor Company in 1920, but Simpson remained with Ford for almost two decades, working principally on tractors and farm equipment. Although not all of his work was transmission-related, Simpson was a noted expert in planetary (or epicyclic) gears. Henry Ford, of course, had long been a committed supporter of planetary transmissions, which he considered simpler to use than gearboxes with sliding spur gears. By World War I, most of the auto industry abandoned planetary gearsets in favor of dual-shaft gearboxes, but Ford held out until the advent of the Model A in 1927. After the war, epicyclic gears had seen something of a renaissance in preselector transmissions and later an emerging breed of semiautomatic and automatic transmissions, the latter best exemplified by the original Hydra-Matic. Before World War II, planetary gearsets remained the exception rather than the norm for automotive use, but, like Henry Ford, Simpson felt that their drawbacks could be overcome through careful design. Throughout the mid-thirties, he developed both two- and three-speed planetary transmissions for passenger cars, the three-speed intended for rear-engine/rear-drive applications. Neither saw production. Simpson left Ford Motor Company in 1938 and the following year went to work for Detroit Harvester, where he served as chief engineer until 1943. He subsequently became a freelance engineering consultant, again working primarily in transmission and drivetrain design. In 1944, he developed and applied for a patent on a new hydraulically operated six-speed planetary transmission for tractors, followed in 1946 by a closely related three-speed passenger car unit. At first, it didn’t appear that Simpson would live long enough to exploit these patents, which were not granted until 1950 (as U.S. Patent Nos. 2,518,824 and 2,518,825 respectively). In 1947, he was diagnosed with what appeared to be terminal cancer and had to set aside his work to focus on treatment. The initial prognosis turned out to be overly pessimistic — Simpson survived 17 years after his original diagnosis — but his convalescence was protracted and led him and his family to escape Detroit winters in favor of milder climates in California and the American Southwest. Nonetheless, he did continue to work at least sporadically, applying (ultimately unsuccessfully) for an additional transmission patent in 1948. By 1950, Simpson had recovered enough to rededicate himself to his work on planetary transmissions, filing a series of new patent applications late that year. Intended to address certain limitations of his earlier designs, his latest disclosures covered several additional improvements on the three-speed/dual-planetary layout, now using two multi-disc (rather than cone) clutches and multiple brake bands, sometimes supplemented with overrunning clutches. Simpson quickly discovered that despite their virtues, his inventions were not an easy sell in Detroit. While he was a well-respected auto industry veteran, that wasn’t enough to overcome major manufacturers’ pronounced disdain for “NIH” (“Not Invented Here”) ideas or technology. Moreover, most of the inventors who had previously broken through that barrier — like Earl Thompson, designer of GM’s “Silent Synchro-Mesh” gear synchronization system and later one of the principal architects of the first Hydra-Matic — had been able to present working models of their designs, something Simpson wasn’t in a financial position to do. If Simpson wasn’t independently wealthy, he was nonetheless very thorough. Having conceived what he deemed a viable layout, he also considered a long list of refinements and variations of that basic concept, many of which he also patented. That left automakers who wanted to take advantage of related ideas no legal alternative but to seek a licensing agreement with Simpson; he left little room for patent workarounds. Ford was followed in 1955 by Chrysler, whose new TorqueFlite design overlapped Simpson’s patents enough that the company was obliged to license them. General Motors followed suit in the early sixties, eventually followed by Daimler-Benz. All of GM’s three-speed Turbo Hydra-Matic transmissions would use Simpson gearsets, as would the three-speed torque converter automatics introduced by Mercedes-Benz, Borg-Warner, JATCO, and ZF in the early seventies. This is not to say these transmissions were identical — each had unique features of its own — or that Simpson himself designed them, which he did not. (He did naturally take a keen interest in production applications, but as an outside observer, not a participant.) Rather, their designs shared common elements covered by one or more of Simpson’s patents. For instance, Chrysler’s patent for the original TorqueFlite, granted in 1960 and credited to Bert W. Cartwright, Teno Iavelli, and Ervin R. Miller, cited no fewer than four Simpson patents. Simpson remained busy with his engineering work and in the Dearborn community into the early 1960s, continuing to invent and patent new planetary transmission designs. By the time he died in November 1963 at the age of 71, he had a total of 40 patents in his name (including ones assigned to Ford or Detroit Harvester during his employment there), 23 of those in transmission design. A 41st and final patent was filed a month and a half after his death and was granted in 1967. The short answer: What we now call a “Simpson gearset” is a compound planetary gear train consisting of two simple epicyclic gearsets sharing a common sun gear. (The sun gear doesn’t necessarily have to be one piece; it can be two gears splined or otherwise linked together so that they act as a single unit.) 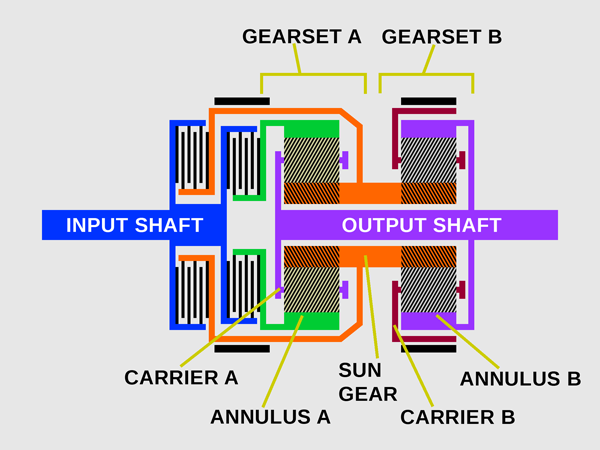 Use of a common sun gear immediately distinguishes a Simpson gearset from the rival Ravigneaux gearset, which has two sun gears of different sizes, using short and long planet gears on a common planet carrier to mesh with a single ring gear. In a Simpson gearset, the annulus (ring gear) of the second gearset — let’s call it B — is connected to the output shaft. 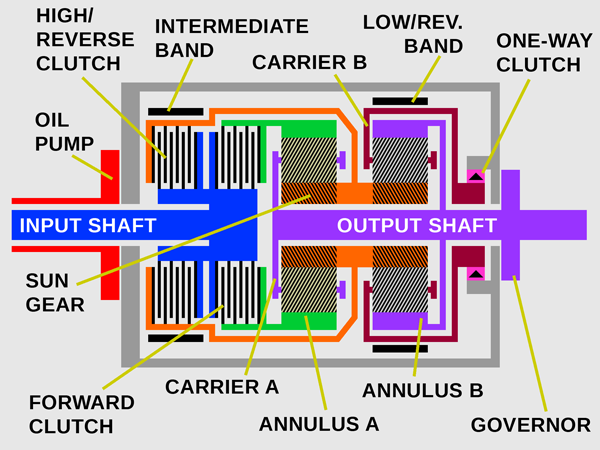 Typically, the planet carrier of the first gearset — let’s call it A — is as well, although in some variations of this layout, carrier A is only connected to the output shaft in the forward gears. This description is necessarily general because there are many different variations of the basic concept, many of them essayed by Simpson himself. 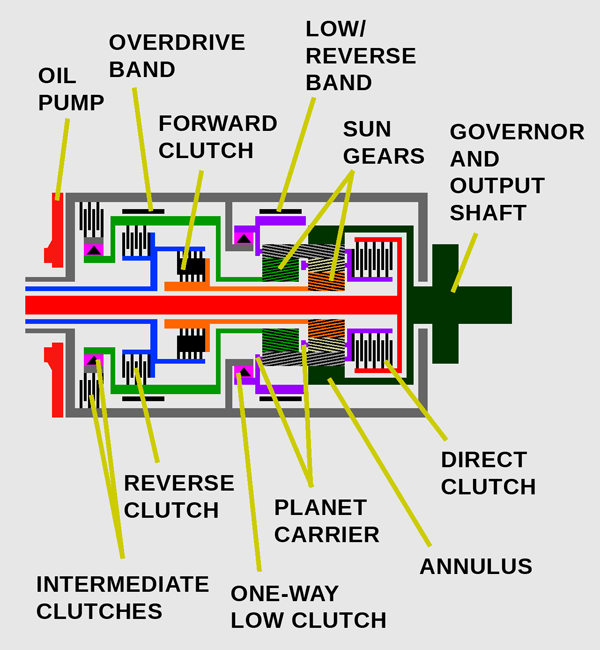 The different permutations use different types or arrangements of clutches and brakes and arrange the various components in different ways. 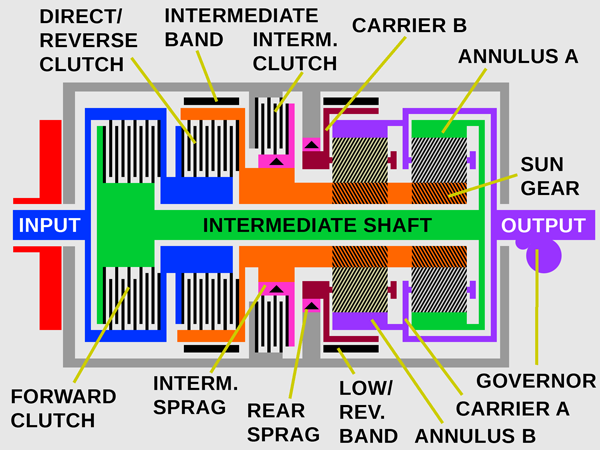 For instance, some variants actually place gearset A behind gearset B, requiring an additional intermediate shaft. A basic Simpson gearset provides three forward speeds and one reverse. The indirect ratios are obtained by holding the planet carrier of gearset B stationary in first and reverse and holding the sun gear stationary in second. In many, though not all, Simpson gearsets, the gears in gearsets A and B are identical. (This isn’t actually specified in Simpson’s patents, but it’s very common.) The commonality reduces production costs — it’s usually cheaper to make multiple sets of an identical part than several different ones — and simplifies assembly, but imposes certain limitations on the range of possible ratios, an issue we’ll discuss in more detail below. Simpson gear trains have a variety of advantages. They’re relatively compact and mechanically straightforward. They allow their various radial and thrust forces to be balanced with a minimum number of bearings, reducing internal friction as well as production costs. Using a common set of gears for both forward and reverse also represented a useful advance over the original Hydra-Matic, which had an additional planetary gearset used only in reverse. By modern standards, of course, any three-speed automatic is hopelessly anachronistic. However, at the time this layout was designed and for many years afterward, three forward speeds was the norm for U.S. manual transmissions. Transmissions with integral overdrives were very rare and many four-speed transmissions (including Hydra-Matic) were essentially three-speeds with an additional extra-low gear, a function that could be performed well enough by a torque converter. Simpson designed a number of transmissions that added a third planetary unit behind a conventional dual-planetary Simpson gearset, giving six forward speeds, but those designs were intended for tractors, which typically have their engines governed to a single fixed rpm; he didn’t consider the additional complexity necessary for most passenger cars. Interestingly, in the mid-fifties, he did design some dual-planetary four-speed transmissions with overdrive top gears, although they used a different gear train layout with separate sun gears. More technical details can be found on the following pages. Thank you for continuing this fascinating exploration of the technical details and history of automatic and semi-automatic transmissions. I’ve been interested in cars since 1985 when I was finally within reach of driver’s license age and I have read quite a bit of the engineering history of the automobile but I still had no idea of the variety of designs that the American manufacturers put on the road before getting to what I always thought of as the norm – three speed plus reverse, torque converter coupled automatic with the PRND21 shift pattern. I had read references to “slip and slide with Powerglide” but the only car I ever drove with an automatic that was different from the C4/C6/Turbo-Hydramatic/Torquflite experience was a VW Beetle with the semi-automatic transmission. I hope you do an article on pre-selectors someday too. In fact, I was just looking at some stuff about the Wilson preselector, which is an ingenious device. Part of the reason I’ve written so much about Hydra-Matic is that I was amazed at how the earlier versions have fallen into obscurity — which is amazing when you consider their production volume. Most mechanically inclined automotive people are probably still reasonably familiar with Turbo Hydra-Matic, TorqueFlite, and the C4/C6, but the older ones are now poorly understood (and some, notably the dual- and triple turbine torque converter transmissions, weren’t that well understood when new!). My daily driver (by choice) is an ’89 Wrangler. Probably one of the last applications of the classic Torqueflite. Three speeds, no lock up, no overdrive, no electronics. Not all that efficient, but over 300k with a single tear down for new seals. Another system that saw service with UK’s BMC and its later incarnations was the 4 speed AP (Automotive Products) automatic transmission. When it was working properly it was an excellent transmission, making automatic versions of the original Mini and Austin 1100 (sold as the Austin America in the USA), and the Austin Maxi. The Mini and 1100 models suffered very little performance penalty compared with stick cars, the Maxi had a 5 speed stick shift, so the automatic suffered in comparison. The designers managed to cram it underneath the engine as in the stick transmission. Even more remarkably, they persuaded it to work sharing the engine oil. However the latter may have proved not such a great idea, they had a very short lifespan, typically 30-40,000 miles. If it had its own separate lubrication I think that would have helped improve its durability. It has long been confined to history now, like so many British innovations lack of investment and development meant it fell by the wayside. I know of the AP automatic, and of the earlier AP Manumatic, but I confess I haven’t ever investigated its innards! Thank you for taking the time to explain all of this as well as you do. I’ve poked my head around inside a few automatic transmissions but never to this level of detail. Of note: You could still find this same layout in use in 2001. Chrysler was unable to prevent their Electronic Ultradrive 40TE from overheating in the Neon compact car. It was then fitted it with the 31TH(A413) TorqueFlite from 1995-2001. 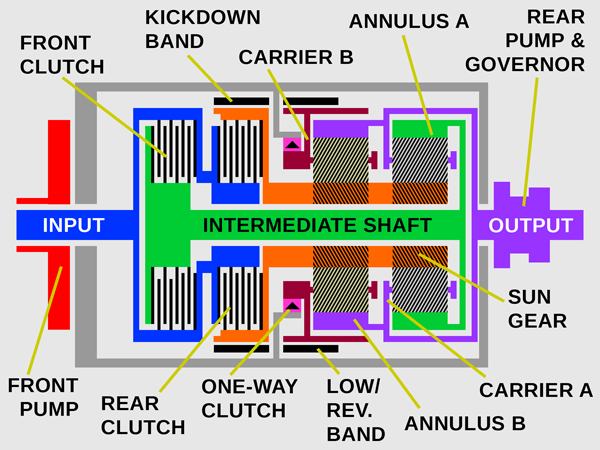 A version of the A904 TorqueFlite with a transfer gearset on the output shaft to connect the power back to a center mounted differential due to the cars transverse layout. The only electronics was a solenoid to engage the lockup clutch in the torque converter. Sadly even the high stall converter used couldn’t overcome the fact that you didn’t shift to 2nd gear until 55mph. Giving the car a reputation of being painfully slow. Yeah, the TorqueFlite survived a remarkably long time, although it really ended up dragging down the image of the Neon (especially in the U.K.).